Built with high quality glass. All wiring is hidden in the column. Filter is extremely quiet. Trickier to clean than other tanks, due to small opening provided. Heater not included. Updated on 2016-12-03 – I’ve always been fond of the Fluval Edge because of its 3D cube design. Not only does it look amazing, your betta will have plenty of room to swim around in since the tank can hold 6 gallons of water, which is ample for bettas. Keep reading for our Fluval Edge 6 Gallon Review. 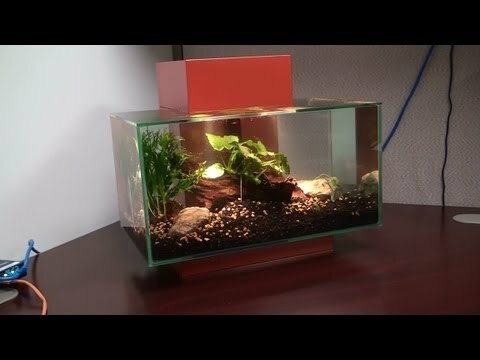 Overall I think this is a fantastic tank for a betta fish. Yes, cleaning is a little bit trickier, but for the price you are getting an amazing 6 gallon aquarium that your betta will love. For those of you who have had one before, I’d love to get your feedback. Just use the comment form below! Interested in other tanks? Check out our other fish tank reviews. Or, check out our Betta Fish Starter Kit section. There is always something good on sale. Until next time. Updated on 2016-12-03 – Updated our Fluval Edge 6 Gallon Review to include more information regarding the contents of the kit. Also, the rating for the size of the tank was inaccurate. Actually not a good tank for a betta, who needs to breathe oxygen from the top of the water. If filled properly, this tank has no air space at the top of the water. Thanks for the feedback Susan. Personally, I’ve never had any issues having bettas in this tank. Yes, the opening is a bit small, but as long as you baffle the filter, I don’t see any issues.